A city court today granted bail to Rahul Mahajan in connection with a case of alleged drug abuse. Special Court Judge Swarna Kanta granted bail to Mahajan on his submitting a bond of Rs 2 lakh and a surety for the same amount. 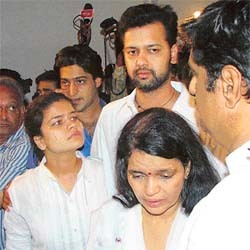 Rahul Mahajan, with his mother Rekha, sister Poonam Mahajan and uncle Gopinath Munde after his release from Tihar Jail, at 7 Safdarjang Road residence in New Delhi on Wednesday. The senior citizens, who have invested in the Senior Citizens Savings Scheme that gives 9 per cent interest rates on investment up to Rs 15 lakh, will have to pay tax who come under the tax net. Union Health Minister Anbumani Ramadoss today said that reservation would be implemented in institutes like AIIMS, PGI, Chandigarh, and JIPMER, Pondicherry, from next year by raising the retirement age of faculty members to 62. A shooter of the Ravi Pujari gang today opened fire at film maker Mahesh Bhatt’s office at Juhu in suburban Mumbai this afternoon. The police said the gunman arrived on a motorcycle at his office and asked for the film-maker. Demanding adequate representation in the Punjab PCC, supporters of Congress leader Jagmeet Singh Brar today complained to the AICC leaders about their “neglect” by the state Congress leadership and said the party’s interests would be served by projecting a “collective leadership” for the Assembly elections early next year. Leader of the Opposition in the Lok Sabha and senior BJP leader L K Advani today condemned the demolition of Krishna Mandir to make the way for a commercial building at Lahore. Panjab University today declared the result of CET-2006, conducted by it on June 12 for admission to MBBS, BDS, BAMS, BHMS, BA L.LB (Hons), B.Pharma and B.Sc (Honours school). The first batch of 2,800 pilgrims began their holy trek from Pahalgam to the cave shrine of Amarnath today after the yatra remained suspended for three days due to bad weather conditions on the 32-km trek.